National Piercing Day is an unofficial holiday observed annually on May 16. Though it may seem like yet another obscure holiday like National Sea Monkey Day or Eat a Red Apple Day, National Piercing Day is arguably deserving of observation for several reasons. While you don’t need a designated holiday to share your passion for piercings, consider celebrating for more important reasons – for example, fighting discrimination against those with piercings in the workplace. By talking about it among family or sharing it on social media, National Piercing Day has the power to raise social consciousness regarding body piercing as an outlet for creative expression as opposed to the association with negative subcultures that it has in some people’s minds. Get pierced! Let your dollars do the talking and get that new piercing or jewelry item you’ve been eyeing. Write an online review for your local piercing shop. Spread positive karma and support the safe, reliable businesses you trust for piercings. The small yet impactful gesture will mean so much to the shop owner and staff. Get involved by researching and lobbying for a specific cause within the piercing community. Maybe it’s better business practices to ensure safe piercing methods or a push for non-discrimination within the corporate environment. Post a picture of your own piercing or an artistic picture of someone else’s photo (with their permission of course) to Facebook or Instagram. Use the hashtag #NationalPiercingDay to spread awareness. Check your local piercing shops for deals on May 16th. If they offer a discount, spread the word among friends and family – you just might persuade your apprehensive sister into finally committing to the cartilage piercing she’s been talking about forever! At Almost Famous Body Piercing, we celebrate National Piercing Day all month long with special pricing on piercings and jewelry. We celebrate May 16 with greatly reduced fees on our body piercing services. It’s an amazing way to celebrate a great day! Blog about what piercings mean to you or why you believe there’s still a social stigma attached to certain piercings over others. You may not have to convince peers, but you could unknowingly influence a parent who holds an outdated belief about piercings or a business owner who still doesn’t allow them in the workplace. Watch one of the many piercing documentaries on Netflix or YouTube to learn more about the cultural significance of piercings. National Piercing Day is always an exciting day at all of our stores. 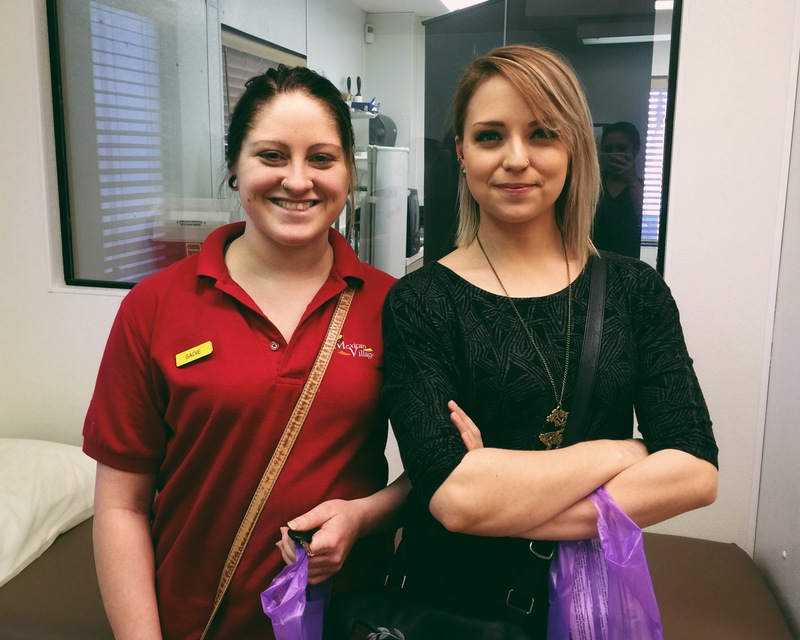 From customers coming in to take part in our jewelry specials to the many nostril, daith, and navel piercings, it’s always a busy and exhilarating day! Our professional staff looks forward to this special “holiday” all year long! Here’s a post from National Piercing Day 2015 – when Y94, a radio station in Fargo, came in to our store to do a segment on National Piercing Day. Amy from the radio station even decided to get a nostril piercing with us! Whether you love piercings as a fashion statement or creative expression, or both, there are many ways to observe the “holey” holiday. National Piercing Day is an opportunity to support independent local business, voice your opinion, drive meaningful change and – at the very least – expand your personal collection of body jewelry. Piercings and Pregnancy. Questions & Answers!